Verschoben vom 30.06.2017 in der Kantine am Berghain! Sämtliche bereits gekauften Karten behalten ihre Gültigkeit! Das Konzert von A Tribe Called Red am 30.06.2017 in der Kantine am Berghain muss aus gesundheitlichen Gründen leider auf den 26.01. ins Lido verschoben werden. Sämtliche bereits gekauften Karten behalten ihre Gültigkeit, zudem sind ab sofort auch wieder Tickets erhältlich. If you’re an indigenous person living in a country that was forcefully colonized, it’s all too common to find yourself underrepresented and misrepresented if not blatantly and systematically devalued and attacked. 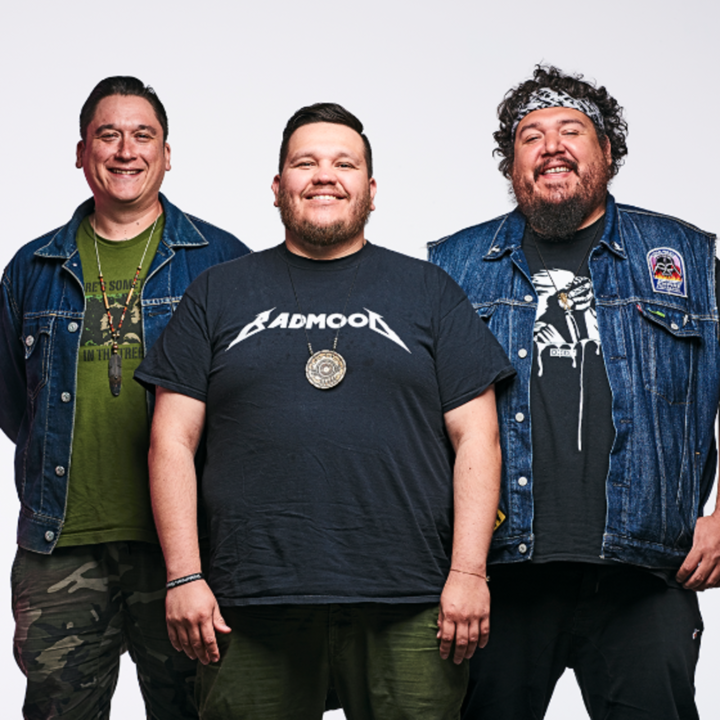 Positive role models and a positive self- identity are hard to come by, yet the Canadian DJ collective A Tribe Called Red is a modern gateway into urban and contemporary indigenous culture and experience, celebrating all its layers and complexity. Looking to the future, without losing sight of their past, ATCR straddles a broad range of musical influences based in modern hip-hop, traditional pow wow drums and vocals, blended with edgy electronic music production styles. Currently made up of DJ NDN, Bear Witness and 2oolman, ATCR first got together in 2008. They are part of a vital new generation of artists making a cultural and social impact in Canada alongside a renewed Aboriginal rights movement called Idle No More. ATCR’s uplifting and inclusive Electric Pow Wow nights on the second Saturday of every month have become an institution at Ottawa’s Club Babylon. There and at their shows, a crowd of Aboriginal Canadians (which includes First Nations people, Métis, Inuit, and 631 other nations) mix with social activists, music heads and anyone looking for a great party and a safe space to come together. They pack the dance floor as Bear Witness weaves indigenous stereotyping from movies, cartoons and media into a new political context and a dancer mixes b-boy and traditional moves. Through the group’s positivity and tireless work ethic their message has expanded to global proportions with tours in Australia, Europe, Mexico and the United States. It’s no accident that Native American activist, poet and musician John Trudell is the first voice you hear on the collective’s third album, We Are The Halluci Nation, as the group considers him a forefather for this movement. The album includes a number of other connections as well, ranging from hip-hop star Yasiin Bey (AKA Mos Def) or Saul Williams to Colombian visual artist and musician Lido Pimienta to native musicians Black Bear, Tanya Tagaq to the Australian aboriginal band OKA or the Swedish-Sami singer Maxida Marak.